• For rapid, quantitative determination of monoamine oxidase activity and MAO inhibitor screen. 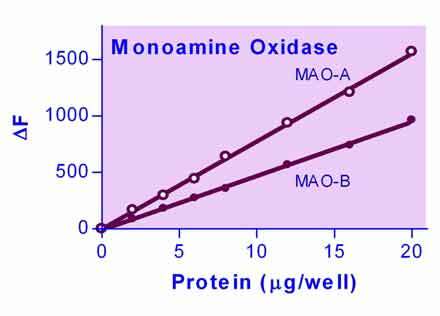 • Monoamine oxidases (MAO, EC 1.4.3.4) are a family of mitochondrial enzymes that catalyze the oxidative deamination of monoamines. MAO dysfunction is thought to be responsible for a number of neurological disorders. Unusually high or low levels of MAOs in the body have been associated with depression, schizophrenia, substance abuse, attention deficit disorder, migraines, and irregular sexual maturation. MAO inhibitors are one of the major classes of drug prescribed for the treatment of depression. BioAssay Systems? MAO Assay Kit provides a convenient fluorimetric means to measure MAO enzyme activity. In the assay, MAO reacts with p-tyramine, a substrate for both MAO-A and MAO-B, resulting in the formation of H2O2, which is determined by a fluorimetric method (λex/em = 530/585nm). The assay is simple, sensitive, stable and high-throughput adaptable. 1. Is it necessary to extract MAO from all biological samples by homogenization and differential centrifugation? Unless one uses pure MAO enzyme, all biological samples will have to be processed e.g. by homogenization in order to release MAO. The exact protocol may vary depending on the sample used and we suggest to research the literature on which methods are suitable for that particular sample. The reference on the data sheet is one example for such a preparation method.